Jarrod Witts kicks Collingwood into attack during Friday's win against Richmond at Victoria Park. Photo: Shane Barrie. The Collingwood coaching staff went into Friday’s VFL practice match against Richmond with two goals in mind. The first was to win the match, a feat they achieved to the tune of 27 points. The second was to pump game time into the legs of several key senior players that were either returning from injury or played only a bit part in the NAB Challenge. Head of Development Craig McRae declared the second aim a resounding success. “It’s about game time at this time of year and those guys got through unscathed, which is pleasing,” McRae told collingwoodfc.com.au. “I was really pleased with Jarrod Witts’ game. I think he’s playing AFL footy at this level, which stands him in good stead for whether it’s next week (against Fremantle in round one) or whenever he gets an opportunity. Collingwood led at every change on an overcast evening at the club’s spiritual home. Although the Tigers remained competitive throughout, it seemed the Magpies always had them at arm's length. “It was a really high standard game for this time of year at VFL level,” noted McRae. The match was another chance for a cluster of VFL listed tyros to put their hands up for more opportunities later in the year. Jack Blair, the younger brother of Jarryd, was one to catch McRae’s eye, but he reserved his highest praise for a forgotten man of the VFL engine room. “Ben Moloney was a player that was leading our best-and-fairest halfway through last year before he got injured,” McRae said. Moloney, who won Werribee’s reserves best-and-fairests in 2011 and 2012, bagged three goals on his left foot in the first half. His third was his most spectacular, roving a Ben Hudson hitout at top speed, splitting a pack in half and jamming it on the boot just 15m from the goal mouth. Ned McKeown, the son of former key position player Ron, made an impact in the second half. He earned the respect of his teammates and the crowd when he backed back underneath a high ball on the wing and held the mark safely despite oncoming traffic. Later, he pushed forward to mark a pass from Peter Yagmoor and duly slotted his first goal on his dad’s old stomping ground. 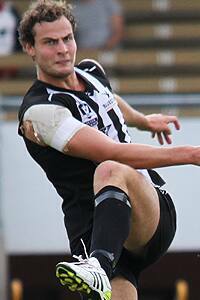 Other VFL Magpies to impress were Lachlan Howe in defence, Lachlan Ferguson with his ferocious attack on the ball in attack and skipper Jack Hellier in the centre. Collingwood’s next VFL practice match is against Essendon at Victoria Park from 11am next Saturday.